Overview – Arkansas Flag and Banner has grown into a multi-million dollar company under the leadership of Kerry Thompson McCoy, with 20 full-time employees. By embracing the Internet, modern technology, and direct purchasing techniques, AFB is moving toward becoming a nationally recognized entity in the flag and patriotic merchandising arena. Additionally, AFB has established the Dreamland Ballroom as a community venue to enhance the availability of quality entertainment and social events. 1975 – Began Arkansas Flag and Banner (AFB) with a capital investment of $400; started work by cold calling businesses to sell flag products. 1975 – 1984 employed in various part-time ventures, while growing the business. 1984 – Hired first sales staff for AFB. 1985 – Secured $20,000 loan for yellow page advertisement in the seven surrounding states to increase sales; moved into first commercial property located on Main Street in North Little Rock, Arkansas; implemented a small, commission based sales force. 1989 – Created the sewing department; purchased the company’s first sewing apparatus. 1991 – Created the graphics design department; purchased a computer graphics machine to sell computer generated banners. 1991 – Began to screen and print United States flags and banners, as a direct result of Desert Storm. 1992 – Used proceeds to purchase and renovate the current headquarters, located in the historic Taborian Hall on Ninth Street in Little Rock, Arkansas. 1993 – Computerized sales and accounting processes; purchased office computers. 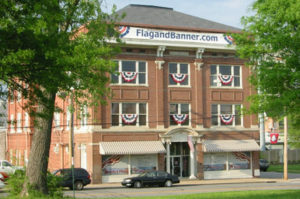 1995 – Purchased the name – FlagandBanner.com in an effort to reinvent the business; launched and managed four websites and subsequent changes. 2000 – Secured $500,000 loan, modernized/upgraded FlagandBanner.com infrastructure. 2001 – Created a retail storefront, comprised of a storeroom for customers to browse merchandise found during buying trips. All gifts and accessories are published and available thru the website: www.flagandbanner.com. 2012 – Complete redesign of website www.flagandbanner.com integrated with in house legacy database for real time inventory. 2013 – Began new SEO, SEM and AdWords campaign redevelopment and was BETA testers for Google Shopping Product Listing Ads or PLAs. 2012 – Began Social Media advertising campaigns, Facebook, Twitter, Google+, Instagram, Pinterest in earnest. 2014 – Hired new sales manager to promote growth in industry and better communication on sales floor. 2014 – Began publishing Brave Magazine which focuses on brave choices, decisions and acts of everyday people as an added FREE customer benefit. 2015 – Company achieved sales of more than $4 Million with website generating more than $1M in sales for the first time. 2016 – Website re-development with focus on Mobile Ready website began. 2016 – Work continues on SEO, SEM and Adwords campaign monitoring and positioning as well as shopping feeds to major outlets Amazon, Sears, Shop.com, Rakuten and PriceFalls. 2016 – Began hosting Up In Your Business with Kerry McCoy on KABF 88.3 FM weekly. It is a 1 hour weekly call in format radio show with area business leaders as guests to help up and coming small business owners gain insights and advice for their own businesses from real life experts. Kerry McCoy is owner of FlagandBanner.com located in Little Rock, Arkansas.